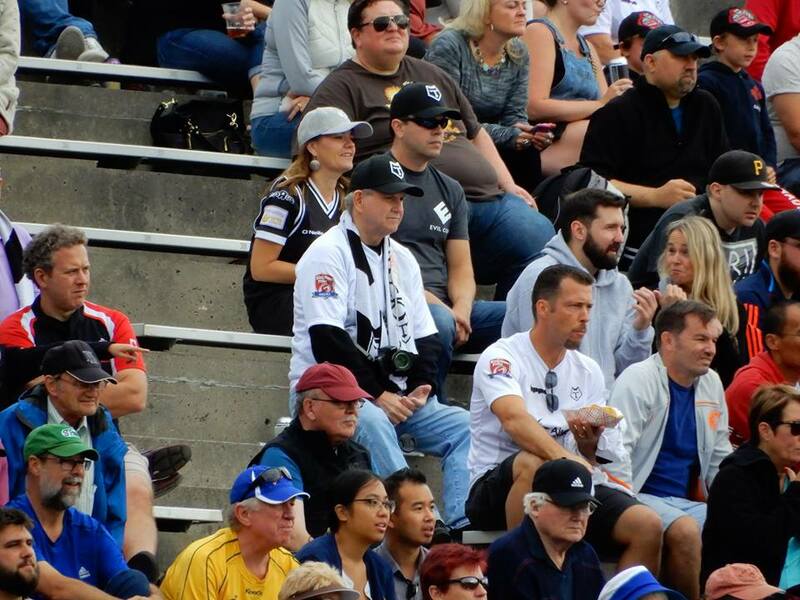 This afternoon the Toronto Wolfpack hosted Whitehaven RLFC in Kingstone Press League 1 Super 8's playoff action. Toronto came into the game in first place with Whitehaven just two wins behind in second. The team that finishes first is, of course, the champions plus they automatically move up a division for the 2018 season. Second place to fifth do a playoff to determine the other team to advance to the higher division. It was a cloudy cool evening for a game, but thankfully no rain. The Toronto She-wolves warmed up the crowd before the game. God Save the Queen and Oh Canada were sang before the game. Forget the empty stands in the background. They don't open up until the start of the game. Whitehaven kicks off to start the game. Here I am watching the game. Here are Teena and I! At halftime, the Wolfpack led 16-6. Home fans are used to a larger lead but Whitehaven was playing great and would have had the lead if the Wolfpack defence hadn't held tight for all the times Whitehaven was pressing for a score. During the break, there was a promotion for the Invictus Games which Toronto is hosting from September 23-30. The hot dog gun is very popular. Fuifui Moimoi almost breaks one. 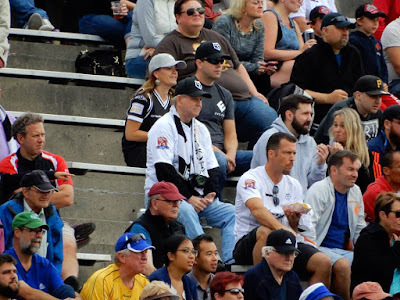 Whitehaven fans came over from England to cheer on their club and hopefully have a great time in our city. Another 50/50 draw that we didn't win. With 23 minutes left to go in the game, Toronto held a slim 20-18 lead. At that point, the game could have gone either way, but the Wolfpack suddenly exploded for 2 quick tries and added one more later on. A scrum with two minutes to go. 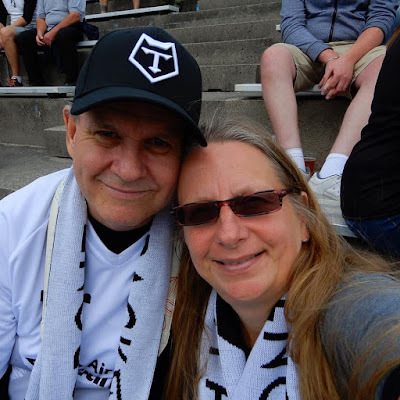 When the horn finally blew, Toronto had doubled Whitehaven 36-18 but it was a hard fought victory. The teams shake hands after. The She-wolves did a celebratory dance. The Whitehaven players came over to thank their fans. The great thing about this league is that it is so fan friendly. Both sides lapped the stadium to thank the fans. Next Saturday the Wolfpack take on the Barrow Raiders who are two wins back but still have to play this weekend. No matter whether they win or lose tomorrow, a win next week means the Wolfpack clinches the championship! Yes, Teena and I already have our tickets (we also bought our season tickets for 2018 while at the game today). What a exciting match it was. You covered it so well through your photography. Match turned into nail biting one after the first half.